Meredith Martinez, 12, poses next to a display of butterfly wings during the annual Butterfly Festival at the National Butterfly Center on Saturday, Nov. 3, 2018, in Mission. MISSION — From Canada to California, thousands gathered Saturday for the 23rd annual Texas Butterfly Festival here. There to greet festival-goers were hundreds of species of North American butterflies. The cool November weather helped attract an even greater number of the colorful winged creatures. The National Butterfly Center in Mission includes dozens of plants, and whose sole purpose is to attract various species of butterflies. In addition to the 100-acre botanical garden, the wildlife refuge includes walking trails, observation areas and educational exhibits. Barbara Turner is a Winter Texan from Ontario, Canada. She said she made a point to attend the butterfly festival because she considers it the Valley’s premier nature event. As Turner speaks, hundreds of butterflies swirl like a miniature funnel cloud around her. 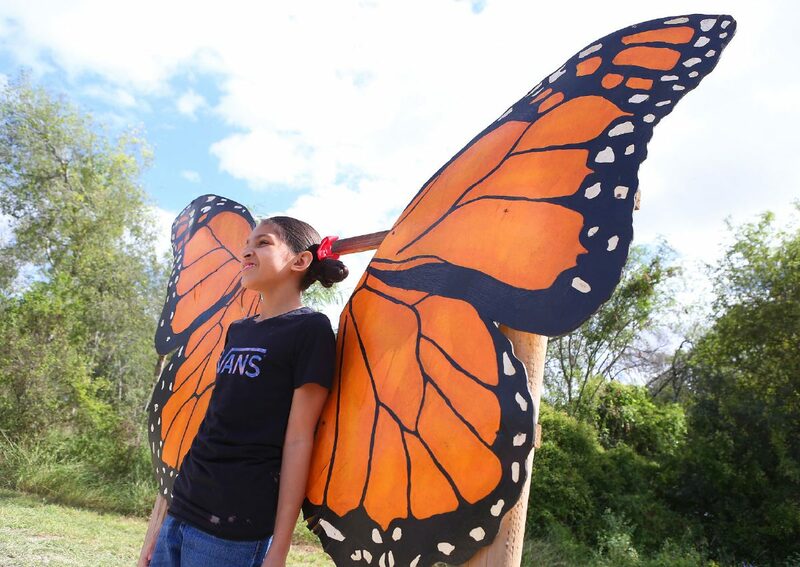 But in recent years, a political battle has been brewing, that many people feel is jeopardizing the future of the Texas Butterfly Festival and the National Butterfly Center itself. President Donald Trump promised to build a wall along the Rio Grande, to prevent undocumented immigrants from crossing the border. A portion of the center sits along the river. National Butterfly Center Director Marianna Treviño-Wright agrees the nature preserve would suffer if a wall is built along the Rio Grande. She says local habitat would suffer lasting harm at the hands of the federal government. Treviño-Wright says the National Butterfly Center is also a vital economic force in the Rio Grande Valley. Butterfly enthusiasts, from all over the United States and the world, travel to the Valley to marvel at the elusive winged-wonders. She says a border wall would have a negative effect on the local economy. The center also showcases animals and plants, in wild and in cultivated settings.